1963 Cheetah "Tribute" - As a friend and I were leaving the 2009 Vintage Fall Festival at Lime Rock, we spotted a car up on the hill that was unfamiliar to both of us. We walked over to it and noticed that it said "Cheetah" on it. I had heard of a Cheetah, but had never seen one and knew little about them. When I got home I looked it up online. According to Cheetahcars.com, what we saw was 1 of maybe 16 cars built and 1 of maybe 8 that still survive. All excited, I fired off an e-mail to my friend, explaining how rare the car we saw was, it's history, etc.,etc. I may have to send another e-mail tonight. Tonight I spotted this eBay listing. Now I have to wonder whether what we saw was the real thing, or a replica. It doesn't really matter, I guess, both are pretty rare. Honestly, "replica" really isn't the right word here, as this car has its own frame. It's not a body dumped on another car's chassis. It's essentially a hand built car. Original Cheetahs were supposedly a handful to drive. This car has modern suspension and braking components. If you're looking for old school performance and want something different than a Cobra "tribute", this would be a cool car. Located in Mentor, OH, click here to see the eBay listing. 1974 Lotus Elite - Yes, as my friend likes to remind me, I like older cars that are "angular and slightly disproportionate". The Lotus Elite fits that bill. This is a "Type 75" Elite. This was Lotus' first 4 seater. It was also the first Lotus to use the "907", 1973cc DOHC Lotus engine. This engine was one of the first 4 valve per cylinder engines to be used in a production car. With its twin Dell'Orto carburetors, the car reached 60 MPH in 7.8 seconds and had a top speed of over 125 MPH. Pretty impressive stuff for a 1970s 4 cylinder car. OK, who am I kidding? There is no way you can call any Lotus practical. Still, if you're looking for a fun, high strung, high maintenance classic car - one with room for a few groceries and doesn't cost a fortune to buy - the Elite is worth looking into. Located in Hot Springs, Arkansas, click here to see the eBay listing for this car. Concept Cars - My friend Jon sent this link to me. It's a collection of pictures of old concept cars. 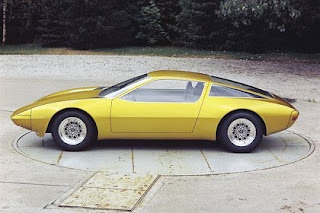 Some, like the 1975 Opel shown above (a concept for a new Opel GT, maybe? ), are really nice looking cars that might have sold well, had they been built. Others, like the 1979 Volvo Tundra Bertone shown below, were outrageous designs that deserved to be (and were most likely meant to be) one-offs. There are over 200 pictures on this Flickr site. It's a lot of fun to browse. You can find the site here. The Volvo Tundra may have deserved to become a "one off," but this was not to be. Through a mix up in the car concept delivery room, the Bertone penned Tundra actually became the Gandini designed Citroen BX. Gandini was working for Bertone at the time. The Wiki for the Tundra states "It was rejected by Volvo and a very similar design was instead sold to Citroën where it was produced as Citroën BX." It still looks crap though. Prior to it being used in the Lotus, the 907 engine was used in the Jensen Healey in 1972. It has been suggested that Lotus used the Jensen as a rolling test bed for it's brand new engine, which did have some problems in it's initial form, like catching fire. I have a 1973 Jensen Healey, and it is a fine example of a classic English sports car, and proof of the prime rule of English Engineering: Why use one part when five will do the same job. Dave, take a look at the Citroen BX (never sold Stateside of course) for a reference point on the Volvo Tundra; you'd be surprised just how similar both cars look. Check it out on Google.